In the second volume of bestselling author Gerald N. Lund's explosive new series, the Eckhardt family finds that the turmoil in their lives will only increase as they try to move forward in a nation divided. Sergeant Hans Eckhardt has been discharged from his military service and wants nothing more than to start a new life with a career and a family, but the unrest swallowing his homeland seems determined to stop him. Fire And Steel is the first series I've read by Gerald L. Lund. In reading these books so far, I have learned so much about history that I either did not know or had never considered. It is easy to see through the lens created by Mr. Lund how the events in the months following WWI ultimately led to the rise of Hitler and WWII. It is particularly chilling to note that the character of Adolf Hitler is portrayed in this book as a likeable young man with an admirable passion for his country. This may come across as a somewhat disturbing illistration for a man who has become a symbol of the most vile evil to walk the earth, but one must understand while reading this that before his final decent into the deepest pit of hellish madness that Adolf Hitler was regarded by many Germans (not to mention much of the world) as a type of "savior" for the people of Germany. People loved him. foreign nations loved him. The media loved him. As they say, hindsight is 20/20. Ultimately Hitler was seen as an answer to a lot of people who were angry at their government. He had the brilliance and potential to be like Gandhi, but his soul festered with the stench of a rapidly growing hatred. This series helps people to effectively see these events from the German perspective. i have listened to the work and the glory series a bit, but this series is so amazing. Fire and Steel, Volume 2: "The Storm Descends"
This was not one of those books I couldn't put down, and I was surprised that I had that feeling. 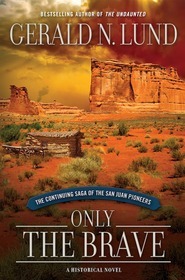 I have read "Only the Brave", and "The Undaunted" and LOVED those books. I have German ancestry, and was so looking forward to reading this book. For one thing, and I wondered how I could let the author, Gerald N. Lund, know that there are many editorial mistakes in this book -- not only typos, but words that should have been something else. I do hope he reads this review. When I did put the book down, it would be for a couple of weeks, and I found myself going back a few pages to recall my memory of where I left off. The story was good, but it wasn't until I was about 55 or 60% into the book that it was starting to be interesting, and I followed it more closely, and wanted it to finish just to be done with it. I am sorry for my feelings and my rating, but that is how it is. I wouldn't mind being an editor for Mr. Lund in his future books. Gerald Lund is really the master at writing a great historical novel. This book is no exception. I loved reading about this time in history and seeing the perspectives of different people during this time period. There's Hans and Emilee, just trying to survive Germany during this turbulent time. I like both of these characters, I love series like these, because it seems as though you get to "know" the characters. I like Hans for the most part, but there were some times in this book that I was disappointed in him for his actions. But then I have to remember that not only is he a fictional character, but this book took place during very trying times and choices may not have seemed so black and white as they do during the good times. Emilee is a great character as well, I love the way that she gets to know Hans' family without his knowledge or even really his permission. I love the way she goes about helping all she can with the soldiers in her hospital and the way that she loves Hans, even when she hates the choices that he's made. I love that the Westland's in Utah appear in this book. I love that they are removed from the war in Germany because they don't live there, but they are still connected because of their heritage. This time in history is fascinating to me. Adolf Hitler, and all the other crazy stuff that went on in Germany is just starting in this series and seeing how Han was in the story helped me to understand just a little bit how it may have been for the people in Germany. I love that at the end of each chapter there is a section of notes to help you better understand where some of the information came from and why. This is an amazing book and an amazing series, so excited to read more! In characteristic Lund style, this book draws you in to a great story. While there was not a tremendous amount of historical material available for this time period, he fills in the gaps quite nicely and introduces the impact of the Latter-day Saint donations to this struggling group of people in a beautiful way. Well done again Brother Lund.